From slick black polished subway tiles to the earth-inspired jewel tones of a naturally textured slate mosaic tile, slate backsplash tile creates a charming atmosphere in a nature-inspired space. Choose from the timeless dark color scheme of grays and sleek blacks or opt for the neutral greens, oranges, and beiges swirled together to create an unforgettable kitchen. With a slate backsplash tile, you can create a kitchen that feels old-world, straight from the heart of an authentic Italian kitchen. You can also find sleek, clean lines of highly polished and honed slate subway tile ideal for a clean and simple modern design that emphasizes dramatic darks. Mosaic tile options give you the best of both worlds, combining glittering glass with naturally honed slate for elegant modern charm. The various textures available with a slate backsplash tile will really draw your eye. Whether you choose rough-hewn surfaces or the slick and smooth, your kitchen can benefit from the added layer of texture and surface detail. With glass and slate backsplash tile, you can make your kitchen atmosphere as charming or as contemporary as you like. Selecting the proper material for your kitchen backsplash is of the utmost importance. You cannot ignore the long-term implications that the maintenance of your slate backsplash tile will require. 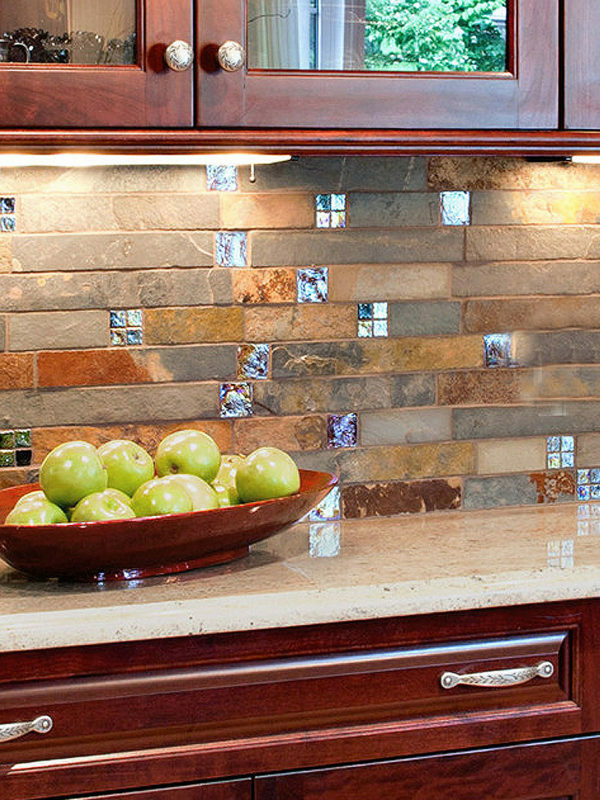 Fortunately, slate backsplash doesn’t require much in the way of maintenance. Slate is naturally waterproof, repelling stains and spills to keep your kitchen sparkling no matter how much time you spend in it. Not only that, but the slate material itself is naturally dense, creating a long-lasting and durable kitchen backsplash that will last you for the years ahead. Opt for slate backsplash tile in a kitchen that is heavily inspired by the jewel tones of the earth, from dark onyx black to more exotic greens and golds. Your kitchen will benefit from the one-of-a-kind natural beauty that slate can offer.